Luke 11:2 He said to them, “When you pray, say: “‘Father, hallowed be your name, your kingdom come. Luke 11:3 Give us each day our daily bread. Luke 11:8 I tell you, though he will not get up and give him the bread because he is his friend, yet because of the man’s boldness he will get up and give him as much as he needs. Luke 11:9 “So I say to you: Ask and it will be given to you; seek and you will find; knock and the door will be opened to you. Luke 11:10 For everyone who asks receives; he who seeks finds; and to him who knocks, the door will be opened. Luke 11:11 “Which of you fathers, if your son asks for a fish, will give him a snake instead? Luke 11:12 Or if he asks for an egg, will give him a scorpion? There is a story that I hope is true about a man working the four to midnight shift every night. He walked home and his route passed a cemetery. One night he was in a particular hurry, and since the moon was full, he decided to take a short-cut through the middle of the cemetery. The route lopped five minutes off his walk, and soon it became his regular path. But on one particularly black night, he had an unfortunate mishap. He fell into a freshly dug grave. He wasn’t hurt but the hole was so deep he was unable to get out. He began to yell, but nobody heard him. Resigned at last to simply wait for morning, when his plight would be discovered, he pulled his coat up around his neck and huddled in a corner to try to sleep. He was awakened in an hour or so by the noise of a falling body. A second unfortunate man had stumbled into this unexpected hole. Sleepily, the first arrival watched his companion trying frantically to crawl out. After a few minutes, he felt obliged to comment, “You’ll never get out that way.” Well—he did! The story illustrates whimsically that all of us have undiscovered and unexpected powers—powers we didn’t know we had. One of the most effective ways to appropriate that power is through prayer. And Psalm 119:111 says this: Your statutes are my heritage forever; they are the joy of my heart. Learning to pray from Jesus – is seen in this wonderful passage in Luke 11. The pattern for prayer called the Lord’s prayer – well we know it all too well – and probably need to spend weeks digging into it. It’s worth a whole sermon series really. For today – what we really need to hear is about the nature and character of God. Jesus doesn’t even go through the whole of the Lord’s prayer here. We have to turn to Matthew chapter 6 (from verse 9) to get our longer version. And it’s not surprising. Either Jesus got carried away on this occasion or Luke got carried away in the writing of his version of events! This whole passage is about one thing! The nature and character of God – specifically as FATHER. Jesus leaps from the model of prayer to stories about the Father and fathers in general. Yes he talks about a friend arriving at midnight asking for bread – emergency rations. But that doesn’t get stuck on the responsibility of friends either. Remember that hospitality was normal and expected in that culture. Both from the guy who had his friend show up (at midnight! )and his friend whom he goes to for help. Boldness is key to the relationship children have with their Fathers. Good fathers whom they trust at any rate. With parents in general there is the freedom to ask what are called BIG ASKS! So when the disciples ask Jesus to teach them to pray – the first words are key. Our Father, (in Matthew – a corporate prayer together which is what we do) or following Luke, simply Father. In both cases the word is ABBA – Father – which is intimate and personal. It is a radical shift fundamental to this new people of the Way – which became the Christian Faith we know today. A wonderful platform onto which we can attach our theology – our beliefs about God’s love, forgiveness and patience. And also his commitment to truth and wanting the best for His children. And Boldness in prayer is Jesus’ pattern – and it is linked to this intimate love. Because God is a father you can ask the world! He won’t always give it to you and he may say wait and trust me! But boldness is an antidote to fear and timidity! 1 John 4:18 There is no fear in love. But perfect love drives out fear, because fear has to do with punishment. The one who fears is not made perfect in love. Then – linked to this too – is Trustworthiness. It comes close to Integrity. The next story he tells is actually funny and powerful all at once. You rotten old sinful fathers won’t give their children a snake when they ask for fish and a scorpion when they ask for an egg! Come on people! Yes there are wicked dads but this is about FATHERHOOD. Man its great when people become parents for the first time! 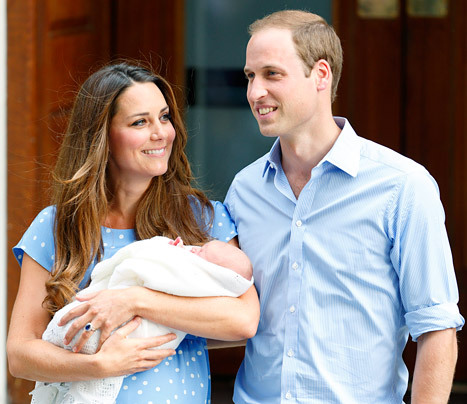 Did you watch Baby prince George come out of hospital? Did you see that dad? Did you hear what he said? William – looking a very happy dad – was going on about the baby being tardy – and how he would have a word with him about it later! But he was all smiles – and I loved it when he took the baby from his wife. There’s a film clip of his dad doing that when he was a baby – taking him on one of those first public viewings – and cradling him so lovingly and proudly. It’s tough being a royal and living in the public eye and under the spotlight. A bit like Pastors kids – no paparazzi for them – just well-meaning church folk! Parenthood is a wonderful gift. Knowing God as Father is more wonderful. Knowing his nature and character is really important. May you grow in leaps and bounds in your relationship with God our Father – in your conversations with him – especially the honest ones where you pour out your heart – where you persist shamelessly like the man waking up his friend to get bread – with confidence, knowing he won’t give you something dangerous when you ask for the things you need. For this reason I kneel before the Father, from whom his whole family in heaven and on earth derives its name. I pray that out of his glorious riches he may strengthen you with power through his Spirit in your inner being, so that Christ may dwell in your hearts through faith. And I pray that you, being rooted and established in love, may have power, together with all the saints, to grasp how wide and long and high and deep is the love of Christ, and to know this love that surpasses knowledge—that you may be filled to the measure of all the fullness of God. Let’s save more time today and each day to pray more. 17 March 2019 Sunday message: Our citizenship is in heaven. 24 February 2019 – Sunday Message: My Peace I give you.